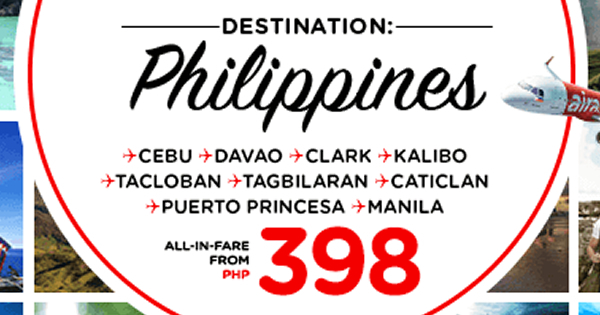 AirAsia's Philippine Destination Promo this summer! Start your summer right with our low fares.You may enjoy P398 All-In on base fare when you book your flights to Cebu, Davao, Clark, Kalibo, Tacloban, Tagbiliran, Caticlan, Puerto Princesa, Manila. Book now till till 5 March 2017, travelling period 31 August 2017. Book now to save more money!